It’s Fire Rated… But Is It The Right Test? This month UL recognizes Fire Prevention Week. This week was originally set aside to remember the Great Chicago Fire of 1871. This infamous tragedy destroyed more than 17,400 structures and burned more than 2,000 acres1. Over the years, Fire Prevention Week has focused on a range of themes, and this year’s theme is “Don’t Wait – Check the Date! Replace Smoke Alarms Every 10 Years.” For additional information about NFPA’s Fire Prevention Week, please visit firepreventionweek.org. 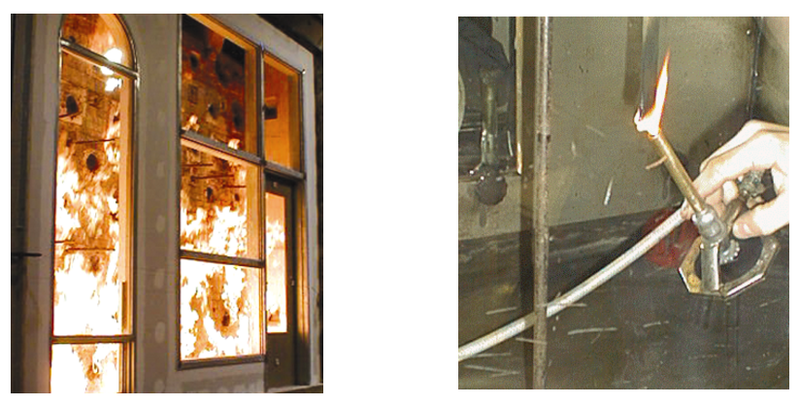 Continuing the theme of Fire Prevention Week, this article focuses on a particular challenge in fire testing and fire prevention for buildings – choosing the right test for the right product or application. Because there are a broad range of fire tests that yield a wide variety of ratings and test values, it is imperative to understand precisely which test is being required or requested, the test method being used, what the fire ratings mean, and which product or system is applicable. Selecting the wrong test may lead to inaccurate data, non-conformity with local code, or more serious – , the selection of building materials that do not afford the desired level of protection. Providing an in-depth understanding of all the possible test method differences is more easily achieved via a detailed seminar; however, here are the most common “fire ratings” that frequently need clarification: UL 94 (HB, V-0, V-1, V-2) – These ratings are achieved through small scale fire tests that evaluate the flammability of polymeric (plastic) materials when these materials are used for parts in devices and appliances. Small samples (5 inches by ¾ inch) are subjected to a ¾ inch, 50 Watt burner flame ignition source. Observations are made of the time to self-extinguishment of the sample, not burning across the entire length, or dripping molten material which ignites a cotton indicator. While these tests and ratings are not suitable for establishing building code compliance of construction or building contents (furnishings or other decorative objects) they do help to ensure that such materials do not propel the fire. Flame Spread Index / Smoke Developed Index – These indices are outlined in UL 723 (also known as ASTM E84). Please visit our second article in this series for details of the assessment of surface burning characteristics of materials within the Steiner Tunnel. This test is used frequently throughout major codes, primarily for the evaluation of interior finish materials. In comparison to the UL 94 ratings assessments, these samples are 24 inches x 24 feet long. The ignition source flame is 4-1/2 feet long (and provides approximately 88 kW of power). Hourly Rated Products and Assemblies – Hourly ratings are assigned to larger scale products and assemblies that demonstrate the ability to resist or contain a standardized test fire. These ratings can either be fire resistance rated (provides fire and thermal resistance) or fire protective rated (provides fire resistance and NOT thermal resistance). The hourly rating shows the length of time that the product or assembly was able to withstand the test fire without exceeding flaming or temperature requirements on its unexposed surface. For example, the furnace temperature at 2 hours is approximately 1750 F and rising. The most common example of hourly rating standard used throughout model building codes is UL 263 (also known as ASTM E119). An example of an hourly rated product is a fire rated exit corridor constructed from fire resistance rated elements to provide a safe means of egress from a building. Class A, B, C – Class ratings can be applied to a range of products, and refer to different test standards depending on the product rated. For example, interior finish materials are classified within the major building codes as Class A, B, or C when tested to UL 723 (ASTM E84). However, Class A, B, and C are also assigned to roofing materials and systems when they are assessed to the fire tests specified by UL 790 (also known as ASTM E108). In all cases though, Class A denotes products that offer a higher degree of performance when subjected to a test fire when compared to products rated Class B and C. The fire ratings and test methods outlined above are a few of the most common tests used within the United States. Looking at fire tests with a global perspective, the number of available test standards and methods multiply quickly. All of these methods have value in their particular use cases, which need to be considered during the product selection process. When evaluating a “fire rating” on a product or system, it’s important to understand what that rating means. Specifiers should help to ensure that the right fire rating, using the correct test, is used to fully meet the requirements of the regulatory codes, and thus achieve expected fire prevention performance. The UL Fire Resistance Directory is a resource that can help assist in researching and selecting the proper fire rated solution. This campaign is part of an educational series of monthly articles featuring different topics that draw on UL’s history. To subscribe to the series, please click HERE or email firesafetyquote@ul.com for more information.